Entering the world of childcare can be an overwhelming process not only for little ones but for parents too. When entrusting the care of your child to someone else it's completely normal to feel anxious and nervous. I think i cried more than Lulu on her first day at childcare! Confidence is key when building momentum around the topic of going to childcare and i think it starts at home. Starting the conversation off at home in the weeks leading up to a childcare visit or first day is important. Exploring the topic of going and how much fun it will be meeting new friends and learning new things will only help built excitement and positive feelings towards beginning their childcare education. Taking a tour of the facility and meeting educators is an important part of settling into a new environment. It will not only benefit your child but put your mind at ease. Goodstart understand it isn’t always an easy decision to use childcare in the first place so they are always there to help the transition. Most child care services are happy for parents to do a centre tour, Goodstart encourage it, so don't feel awkward about visiting and make sure you ask lots of questions. Arming yourself with a list of questions to ask while touring the centre is the perfect way to satisfy all curiosities about what a typical day's routine looks like and make you feel confident you're making the right decision to enter your child into care. Plus being organised will help you stay on track when doing a tour so you can be actively exploring along side your little side kick. If your kiddo see's you engaging and enjoying yourself on the tour the more relaxed they will be. Be sure to use some encouraging language and try to inspire them to wander and mingle with the children by themselves. Lulu didn't want to leave when went for our centre tour and i literally had to pick Marley up and carry her out on hers! I've put together a list of great questions to consider when going on a centre tour that i know will help assure you that your munchkin will have the best start at an early education. 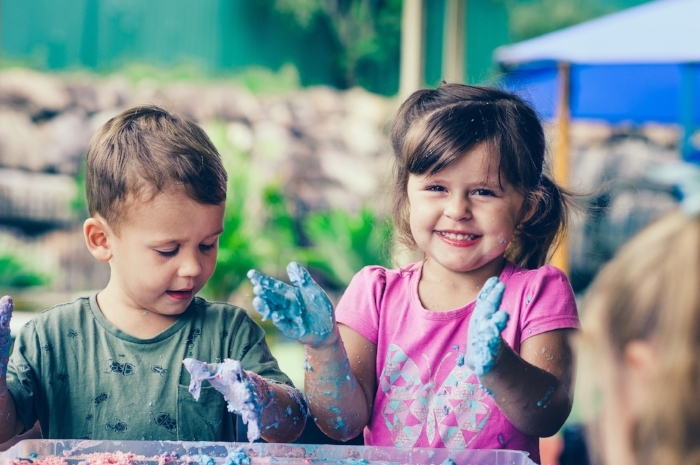 Remember finding a quality childcare centre is so much more than liking how a centre looks, it's about what is going on inside the centre that counts. If you'd like to enquire about or book a tour of a Goodstart Early Learning centre, click here. What are the centre’s operating hours? Who Is the centre manager, can I meet him/her? What’s your sick child policy? What happens if need to miss a day due to holidays or illness? How many children attend the child care? What is your child to educator ratio? Are all staff members trained in first aid? Can I call the centre if I wish to check on my child throughout the day? Do I need to provide nappies? If you need to provide your own and you use cloth/eco nappies how will they handle that. What do you serve for meals and snacks? Or do parents need to provide food? If your child has food related allergies, be sure to ask about how they handle specific dietary requirements. Is water offered throughout the day? If babies are taking bottles, ask how they handle frozen or pumped breast milk or formula preparation. Do you administer medication if my child needs it? If yes, I recommend sharing an accurate schedule so medication can be given correctly. What is the toilet training procedure? Some day cares will assist you in starting toilet training once kiddo's reach a certain age. How, and how often, do you clean/sanitise the toys and materials used by the children? What if my child does not sleep? Can my child bring a comfort toy for sleep time? What’s your general philosophy on childcare? Do you have a centre policies and procedures manual i can see? Can I claim the new child care subsidy? Find everything you need to know about how to optimise the new subsidy here. If I have a grievance or need to give feedback how would I raise that? How do you handle discipline or behavioural problems? For instance, how do you handle biting, hitting, or bullying situations? Does the centre offer a diary or communication folder so parents can view the activities that happened throughout the day? Do you offer assistance for children who need extra help with learning? Do the children engage in both planned programming and free play everyday? Will all my child's educational experiences be documented to follow his/hers development? Be mindful that drop off and pick up times are probably going to be a bit chaotic so ask what an appropriate time would be. That way you wont feel rushed and you'll have every opportunity to ask questions. Have a good look around, take your time. How's the vibe in the centre? When i first visited the Goodstart Early Learning centre that Marley will be attending i felt really welcomed and the atmosphere was calm, cool and inviting. Marley surprisingly wasn't shy, which she normally is. She played with other children and wandered around by herself. I totally believe it was due to the relaxed and homely feeling she felt being there. It didn't feel cold and sterile, it was just like home. Other things you can do as you look is pay attention to the interactions between staff and children, take note of the activities the children are doing. Is there a good range of toys suitable for all different kinds of play? Can you hear the sounds of happy kiddo's playing? I've always been a big believe in trusting your gut. I knew as soon i stepped foot into Lulu's child care centre tour at Goodstart Bondi she was going to have the time of her life. It just felt right. Even to this day she talks fondly of her time there and has even said she wished she was still going there instead of school. When it came time for Marley to start childcare it was a no brainer for us, we knew she would be going to a Goodstart Early Learning centre. It didn't even cross my mind to explore any where else. I love how nurturing their educators are, how exceptionally high their standards are and know that my children always feel safe and taken care of. Piece of mind is everything when embarking on a new chapter in your little ones life. I can't wait to see how Marley's adventure begins. Click here to find a Goodstart centre near you and book a tour.